Normally when I travel, I like to blog as frequent as I can. However, the Internet has been spotty at best. When I do have a chance to get in front of a monitor, it’s not on my computer, which means I don’t have access to my images (or a U.S. keyboard). Again, this is short post. I wish I had time to elaborate on each place I’ve been, the cold beers I’ve drank and the incredible foods I’ve ingested. As of now, I am currently in Austria and it’s beautiful here. By far the most beautiful city, the hills ARE alive in the sound of music (that’s for you, Mom). I don’t expect to blog until back in the states, so this could be my last post from Europe. I’ll be sure to make multiple posts when I get back. Ciao. 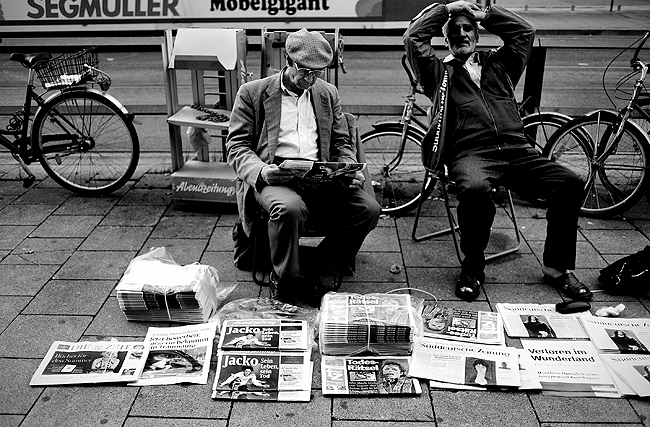 “Following the death of international pop star Michael Jackson, headlines read of his passing on German newspapers as a media salesman waits for potential buyers on the streets in Munich, Germany, Friday, June 26, 2009." I am still in Europe, but I am without Internet and the ability to post anything new. Hopefully, when I get to Salzburg tomorrow I'll be able to update. Until then, thanks to the Apple Store in Munich, Germany for the free Internet. I needed to connect with the news, and was shocked that Micheal Jackson passed when I caught up just now. OK, enough of this Euro keyboard. Finding the letter 'Y' is a challenge in itself! "A street performer dressed simply in only a thong, dangles upside down in the Leidseplein square in Amsterdam, June 21, 2009." Some say that anything goes in Amsterdam. While that generally seems correct, there are still laws and hard drugs are officially illegal. The barely dressed women posing in the windows of the world-renowned red light district, the stench of the marijuana freely lingering in the air at café shops, the history of Anne Frank, and the other characters you see roaming the streets. It really is like stepping into an entire different country: literally. But most stays the same about Europe to me. It’s super easy to travel, for the most part safe to walk the streets any and most people speak English. Two things I absolutely love are the long days and the feel of the city. In Amsterdam it’s hard to realize you’re in a “city.” When one thinks of city, they would say skyscrapers, non-stop traffic and mobs of people. While parts can be crowded, the city is what I call an old town. There are no tall buildings, nothing is modern and it really feels like you’re in Disney World (if you have ever been to Epcot). I find myself staring, thinking, is this real? Is this just a fake building or do people really live here? It really is awesome. The second part is the best. The long days. No joke, I am looking out my hotel window right now at 10:44 p.m., and it’s still not pitch dark. I would say the sunsets at 10:15 p.m. or so. I LOVE THAT! Anyways, I am again paying for Internet, so making this a quick post although I have a lot on my mind and lots of photos. Nonetheless, I thought the above summed up Amsterdam well. 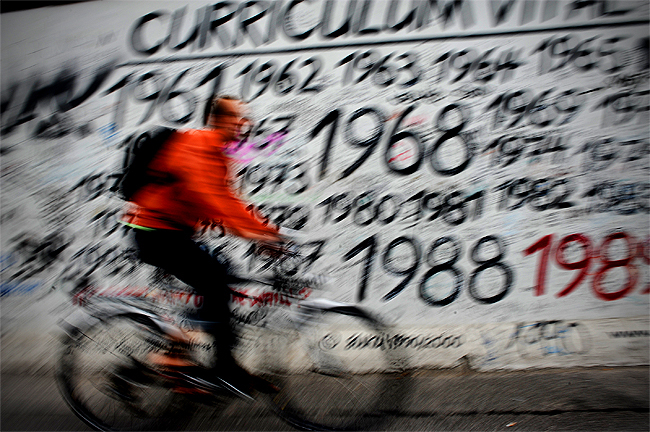 "Traveling down the sidewalk, a biker navigates by the remains of The Berlin Wall in Ostbahnhof, Germany, Friday, June 19, 2009." I’m currently in Berlin, and it’s fantastic over here. This is my first time to Europe and everything is basically how I read about: good beer, great food and easy to navigate. So far, I’ve devoured some schnitzel, blood sausage, regular sausage, enough brats to make any local German happy for weeks, and kurry wurst among other great eats. Did I mention the beer is good? I even had a green beer. The green beer is a local brew (although some say it’s a bad beer for German standards) with a bit of a twist. I had it at a beer garden with a little bit of reservation after I asked what the most popular beer at this establishment was. They pour the beer into a glass with green, sweet tasting syrup called waldmeister, which is a flavorful herb. Spike it with a straw and serve cold. Obviously the nice German woman serving me knew I was a first-time tourist to Berlin. I think I caught a couple laughs, but then again, I could have just been thinking that in my head since I was not only drinking a colorful beer, but also from a straw. Bitte! Unfortunately, I am paying to use the Internet right now, so I am wrapping this post short. Apparently this hotel doesn’t supply it for free, which is a total bummer. But at least I should have it for the remainder of my travels. I’ll be making my way to Amsterdam in the morning and will be posted up there for two days before making my next move. Stay tuned. Hopefully I’ll be able to update frequently. 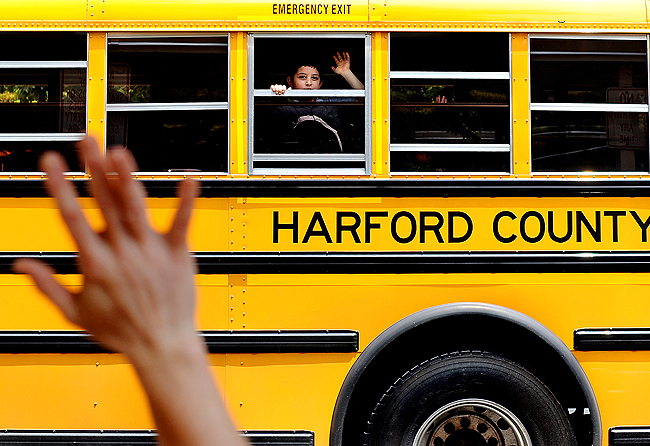 "A student waves to teachers as children depart Homestead-Wakefield Elementary school in Harford County on the last day of school, Friday, June 12, 2009." CAVEAT: Let me preface and say I will hopefully be posting in coming weeks, but I am leaving for international travels today and will return July 3. If posting is slow, I apologize. When I return, I will be back to regular posting. Thanks! 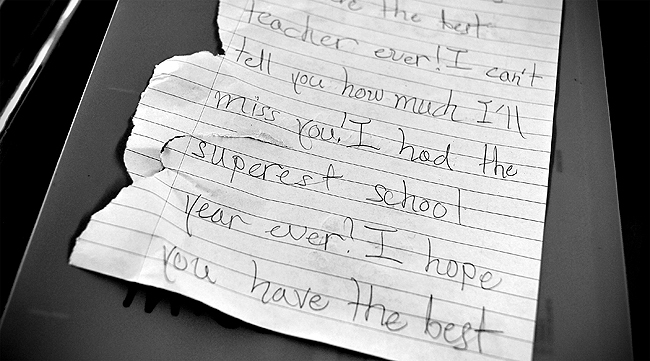 Way back when I was in elementary school I remember screaming out of the school bus window on the last day of school as my teachers stood on the sidewalk waving and sending us off into the summer. Nothing has changed, the same thing happens some 16 years later. Although, kids aren't as wild as I once recall. Thinking back, I would basically hang out of the window of the bus and shout at the top of my lungs as I celebrated another school year completed. Shooting these elementary school kids was endearing, but not one kid caught my eye as a funny moment. While it was nostalgic and made me smile, it didn't make me laugh as I thought I would. I was sure some kid would moon the teachers from the bus window, flip them the bird, throw a juice box at one, or at the very least, smash their face against a window. OK, OK. Maybe I was wishing for something that probably has never happened, minus the latter. Alas, it was merely bland faces and waves. Half of the buses now have windows that don't even allow students to see out of them when opened, which limited the number of buses I could shoot, too. Now that I think about it, the real photo was probably of the teachers when went back into the school. I am sure they were pounding vodka and Jack Daniels as they celebrated their summer freedom without dealing with 20 odd something seven-year-olds for eight hours each day. 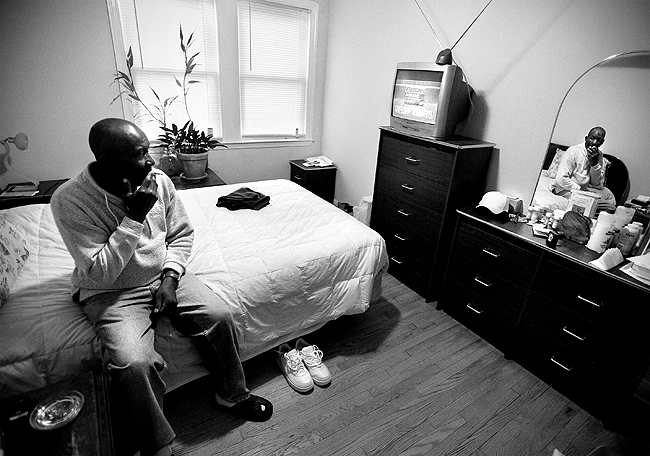 "Prior to Americorps arriving to install a converter box, Burnett Roane, 64, watches Divorce Court on his analog television at his Baltimore home, Thursday, June 4, 2009. The full switch to digital television is June 12." This past week marked the change from analog to digital TV and I was assigned to shoot local Baltimore resident Burnett Roane as he went from a fuzzy, one-channel reception, to having a digital converter installed and to a clear view of his favorite programs. However, it wouldn't be that easy. Roane, a 63-year-old widower and great-grandfather, was anticipating a free, in-home converter installation by AmeriCorps volunteers who were to switch his TV from analog to digital television signal reception. I arrived 30 minutes early prior to the AmeriCorps folk and reporter showing up. I basically made some frames as Roane watched Divorce Court on his rabbit ear TV. The picture was horrendous. It barely filled the screen and looked like a beach. Grainy. Not to mention, it was almost impossible to tell what was going on. Nonetheless, his appointment for 5:30 p.m., was pushed back by the volunteers until 7 p.m. So the reporter and I opted to come back in an hour. I grabbed dinner. He went back to the office. When we got back, they showed up. They were two hours late, and would leave minutes later... without the task being completed. Roane didn't have a converter box and was left confused. But a volunteer explained that they were there only to hook up the converter box, a procedure that takes only a few minutes, not provide the necessary components. Thanks to a series of misunderstandings, I wasn't able to make the frames my editor wanted, the reporter wasn't able to write the story his editor was expecting, and Roane was left exasperated, as he wasted his entire day waiting for his TV to be converted. While my picture may have not have been of volunteers installing a converter box, I still liked the simple view of Roane watching TV analog style in his bedroom. 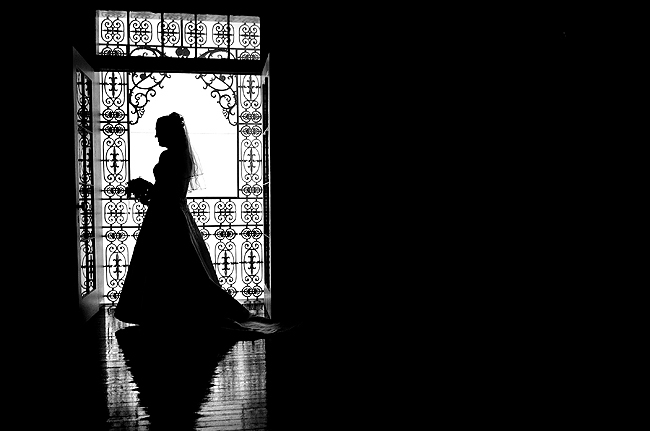 "Newlywed Kristi Newcomb poses for a portrait after her wedding ceremony at Mount de Sales Chapel on Saturday evening." 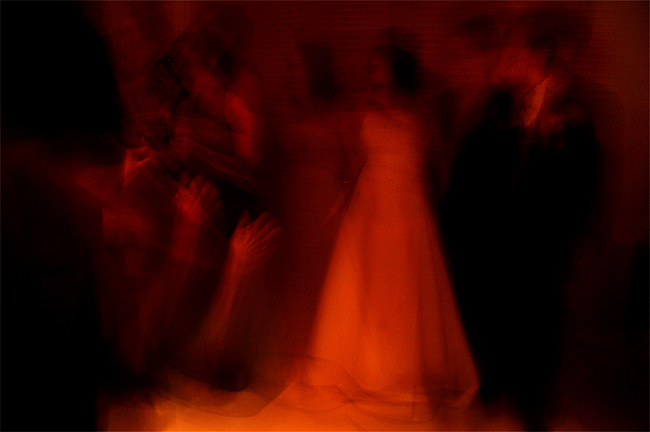 One of the worst parts of shooting a wedding isn't shooting. It's the editing. Fortunately with weddings, there is no need to write captions and then write cutlines for each frame, which does make live easier. Unfortunately, editing down all your photos and then toning them can be time consuming and tedious. Thankfully I love doing what I do and can normally make it a two day process with some good music going. A couple hours one day editing the entire take, and a couple hours the following day to tone. 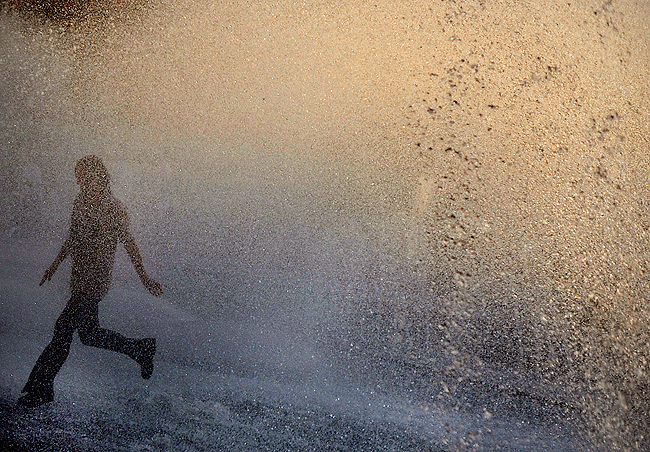 Being a photojournalist, I like getting shots one would pass up on, like this frame. 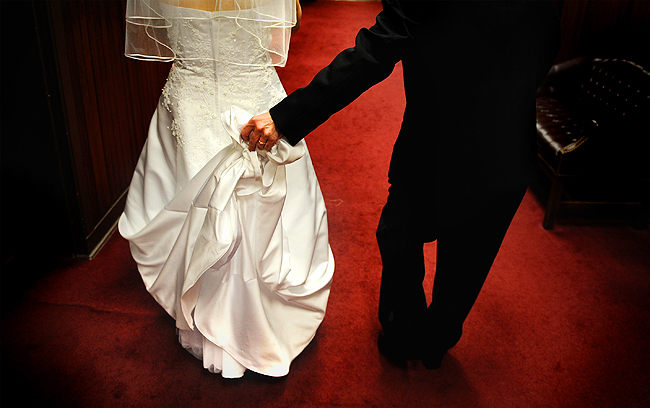 Right after their vows and the knot tied, the newlywed couple were heading out for portraits. While Dave was getting ready, I was getting the moments I thought they would love to remember, but may not necessarily remember. Although I didn't shoot any portraits (that was Dave's job) I did manage to steal the bride and groom for a couple seconds to take this frame. I am not sure what my kick is with black, clean frames of recent, but I think they really liked this frame when I showed them. Now let's see if I can squeeze in a bunch more posts before I head out of the country next week. "Dave and Kristi Newcomb dance with friends during their wedding reception at Michaels Eighth Avenue on Saturday evening." I recently shot a wedding with my buddy Dave Hoffmann and had a blast. While I don't shoot that many weddings each year, I do enjoy documenting that special day for others. 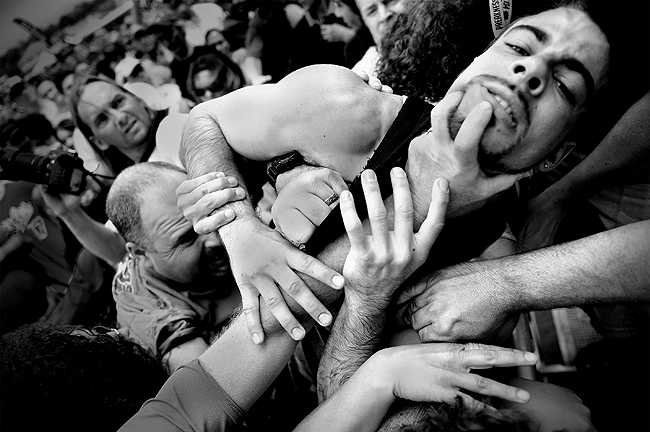 Since I was technically the "second shooter" for this gig, I had fun taking some risks than normal. This frame being one of the more interesting ones in my book. This was an outtake from the wedding. Dave and I were sharing some Alien Bee strobes at the reception, and as per usual when the drinks start flowing, I was flash dragging during the dancing. I was getting some fantastic results taking the shutter way below where I normally would for this type of frame. We must have fired a picture milliseconds between one another and I caught the tiniest bit of light to make this scary, yet interesting picture. By far one of my favorite frames from the day. I am absolutely positive the client would not agree. One more wedding photo then back to the normal stuff I promise. "A firefighter rescues a small dog, as others extinguish remaining flames, after 816 Sherrill Dr., was stuck by lighting, in Pylesville, Md., Tuesday, June 9, 2009. A neighbor notified firefighters that no one was home and that he had been in contact with the homeowner. Two dogs were safely pulled from the fire." I was heading up to a friend's house for a cookout and I noticed the sky getting darker and darker. The temperature was impeccable and so was the light, so I rolled down the windows and creeped down the road shooting from frames from my car. The further north I went on my 20 minute drive, the more sinister looking it got outside. I was literally driving right into the storm. Alas, the rain started and before I knew it, it was hailing. It was a long, slow drive and I'll admit I was a bit freaked out. I have never seen hail so big and the wind blowing so fierce. But eventually I made it through and pulled over in a school parking lot to watch the storm that I survived from afar. That's when I saw a fire truck go whizzing by. 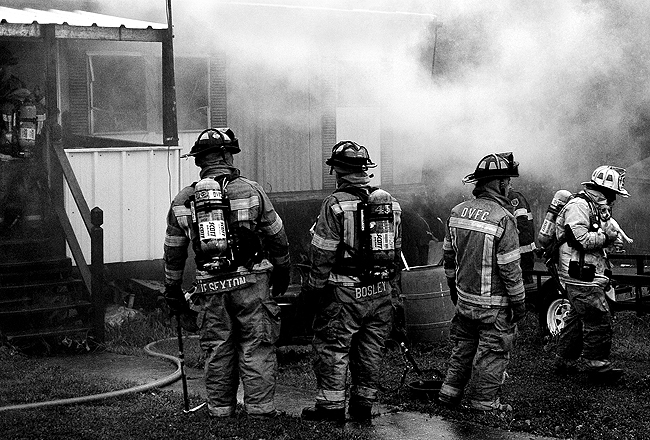 It wasn't hard to follow the sound of the truck and the smoke of the fire. A house had been struck by lighting and I made it there shortly after a handful of surrounding fire stations. I threw on my rain coat and a ball cap, and ran up and started shooting. It was pouring rain and all I had was my a 35mm and one camera, which I had wrapped in a pair of rain pants to keep dry. No one was home during the blaze, but the firefighters pulled two dogs from the blaze. After I left, I realized that not only did I not have all my gear, but I didn't have my computer either. I ended up e-mailing the paper three raw photos from K's computer, including the above. But I doubt they will crop it or tone it in the same manner as me. I guess I'll see in the morning if they run it. Alas, I think this photo is OK, but it is what it is considering I shot with a 35mm, had limited access and is what I call a "super-crop." "St. John's Brooke Wilson (No.2) cannot contain herself as her and teammates celebrate their, 14-13, win and first IAAM C Conference championship at Gerstell Academy, Sunday afternoon. The Saints' Katie Watson closed the gap to 14-13 with 7.4 seconds to go, but St. John's won the ensuing draw." I was not scheduled to shoot the game before the IAAM A Conference girls lacrosse championship (below post), but I was early and decided to shoot the thrilling end to the game before. Two other photographers instantly rushed the girls after they went crazy, so I ran out there to make a couple frames, too. When I emerged from the pile of screaming girls, and was able to hear again, I liked this one. "McDonogh attacker Ali Carpenter (No.4) screams in joy with teammates after defeating Notre Dame Prep, 13-11, in the IAAM A Conference girls lacrosse championship game at Gerstell Academy, Sunday afternoon. McDonogh who was ranked No.1 prior to the match finished with a 19-1 record." Lacrosse is well over here in Baltimore, but I ended the season with a pair of high great school girls games. The first of two games featured powerhouse teams McDonogh and Notre Dame Prep, who were ranked No.1 and No.2 respectively. The entire match was a sea-saw, back-and-forth battle. A one goal game the whole time. I continually found myself sprinting up and down the field to capture the winning teams efforts. But as in any championship environment, I wanted to make the jube and/or dejection at the end of the game. With time ticking down, I threw on my wide angle waiting to rush onto the field to capture to pure joy of McDonogh, but also had my long glass on my main body. While I normally shoot from a distance with long glass, recently I've been conferring with other photographers (if it's a small high school game) before the end of the match to make sure we have mutual agreement to where we will shoot the pile up from. I know I wouldn't want to get in their way, and viceaversa. In this case, there wasn't really any photographers there from publications, so I planned to rush the field. But when the buzzer sounded, I felt the urge to shoot with the longer glass and stay back. Enter the above frame. Eventually the other photographers rushed the pile up before me, so I made my way out to the girls. This is when the most crazy thing I've ever seen happen - One of the players in jubilation turned and hugged a photographer. I was laughing entirely too hard and in shock that I didn't get a frame of it. I guess it didn't help that the photographer getting hugged by a player was me. Hahaha. 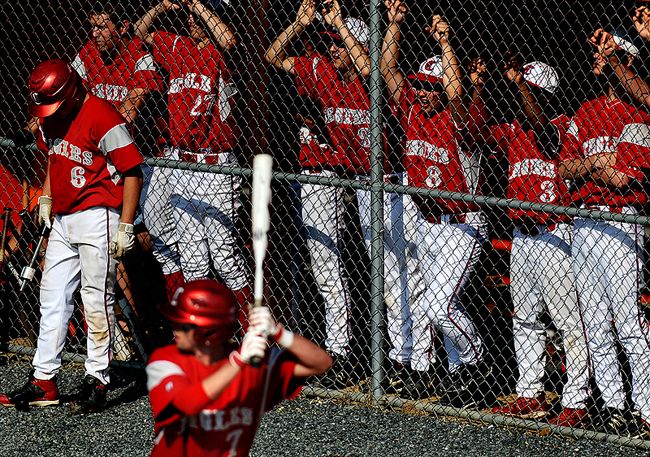 "Centennial players watch play during the bottom of the sixth inning in the 3A North Regional Championship at Fallston High School, Friday afternoon. Centennial fell, 6-4, ending their season." In May, I jinxed myself. I was telling my buddy how I had not shot sports in a couple weeks, then I got six sports assignments in a row all within two days. This baseball game started my sports assignment fiasco. To preface, I hate shooting baseball. I don't know why, just always have had this weird hate for it. Nonetheless, everytime I shoot a game, I try and shoot it differently with hopes of sparking a new interest for the game. During this game I decided to climb the grassy hill next to the field (in one-foot tall grass and next to the main road) to get something something fresh, different than the standard play at second base. For some reason, I kept looking at the players peeking through the fence. No matter what happen, between each pitch, I was trying to fill the frame with players peering through the fence. I finally got a nice angle on it and waited for a player to be up to bat and on deck to help complete the frame. Although I don't shoot much baseball, I've never seen a dugout protected by a chain link fence. Almost makes me wish they had that for photographers, because I am always afraid of taking a ball to the skull or even worse, to my long glass. Or wait, shouldn't that be the other way around? 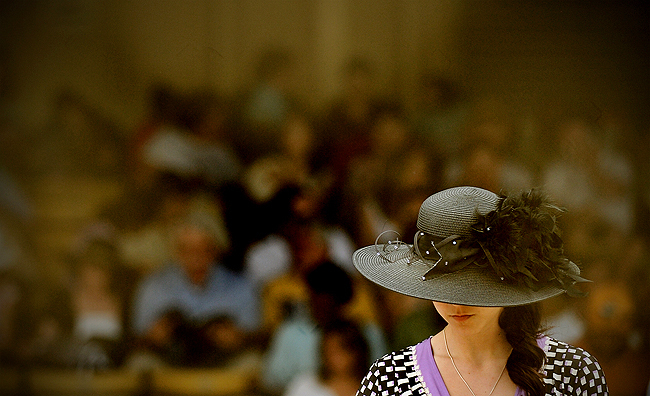 "Tessa Paris of Ashburn, Va., reads the odds of a race in the grandstand during the 134rd Preakness Stakes at Pimlico Race Course in Baltimore, Md., Saturday, May, 16, 2009." 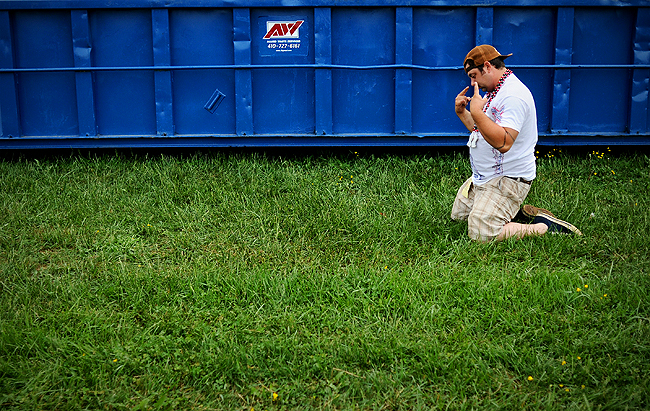 What can I say, Preakness was not the same. Simply put, the drunken debauchery was held to a minimum. Hunter S. Thompson once said, “The Kentucky Derby is Decadent and Depraved” and I was under the impression that after being to two previous Preakness events that the three big horse races were the same way. Wild people. Naked revelers. Fights. Flying beer cans. Passed out patrons. One big party. Etc. Etc. However, new for 2009, Preakness management decided to ban all outside alcohol. In past years, college kids and other infielders would bring 30 30-packs of beer just for them and their 10 friends. Inner city kids would literally lug all these folks beer and stuff in shopping carts for some tips. In other words, the infield was out of control. But a photographers paradise. After walking into the infield when I got there, no one was there. It was quite, tame and aside from this drunken guy and one fight during ZZ Top; I really didn't see anything out of the norm. I ended up sticking around the grandstands most of the time. The day was long and I don't have much to report on it other than I was thoroughly disappointed in the entire event. I can only hope that the sanctuary we photographers call the infield will be returned to its normal state in coming years. AND... as you can probably notice, I am still playing catch up. I shot a lot of cool stuff in May. Stay tuned.